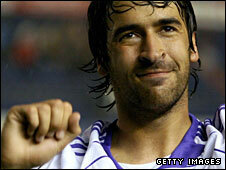 Veteran Real Madrid striker Raul has been left out of Spain's squad for next month's European Championship. The 31-year-old, who has not played for his country since September 2006, had been tipped for a recall after scoring 18 goals in Real's La Liga success. But coach Luis Aragones has opted for uncapped Real Zaragoza forward Sergio Garcia instead. Liverpool's Pepe Reina, Alvaro Arbeloa, Xabi Alonso and Fernando Torres are all included, plus Arsenal's Cesc Fabregas. Apart from those five Premier League representatives, all the other 18 players in the 23-man squad play their football in Spain. Aragones defended his decision not to recall Raul, Spain's all-time leading scorer with 44 goals in 102 internationals. "It isn't a case of ending the debate over Raul," he said. "I focus on the players not the clubs. "There are other players who have scored more goals (than Raul) per minutes played, and they aren't coming either." Villarreal were rewarded for an outstanding season, in which they pipped Barcelona to second place in La Liga, with places for Marcos Senna, Joan Capdevila and uncapped midfielder Santi Cazorla. As well as Liverpool, Valencia also supply four players in defenders Raul Albiol and Carlos Marchena, midfielder David Silva and striker David Villa, with only three from Barcelona and two from Real Madrid. Spain, who have gone 14 games undefeated, play friendlies against Peru on 31 May and USA on 4 June. They kick off their Euro 2008 campaign in Austria and Switzerland against Russia on 10 June before facing Sweden on the 14th and defending champions Greece four days later. The squad announcement had been delayed for 24 hours following the death of Spain's doctor, Genaro Borras, on Thursday. Forwards: Fernando Torres (Liverpool), David Villa (Valencia), Daniel Guiza (Mallorca), Sergio Garcia (Zaragoza).